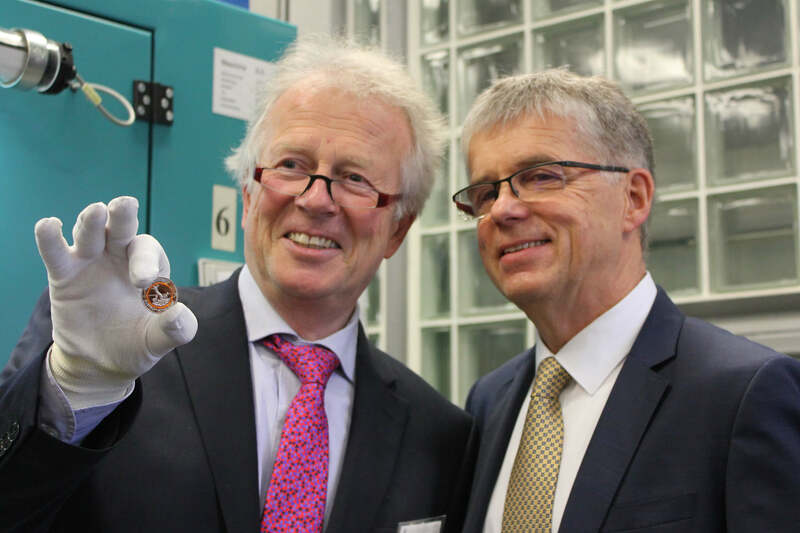 On 8 December 2017, Assistant Undersecretary Walter Leibold has struck the very first 5-euro collector coin “Subtropical Climate Zone”. He thus set the wheels in motion for the production of the second issue of the “Climate Zones of the Earth” coin series. 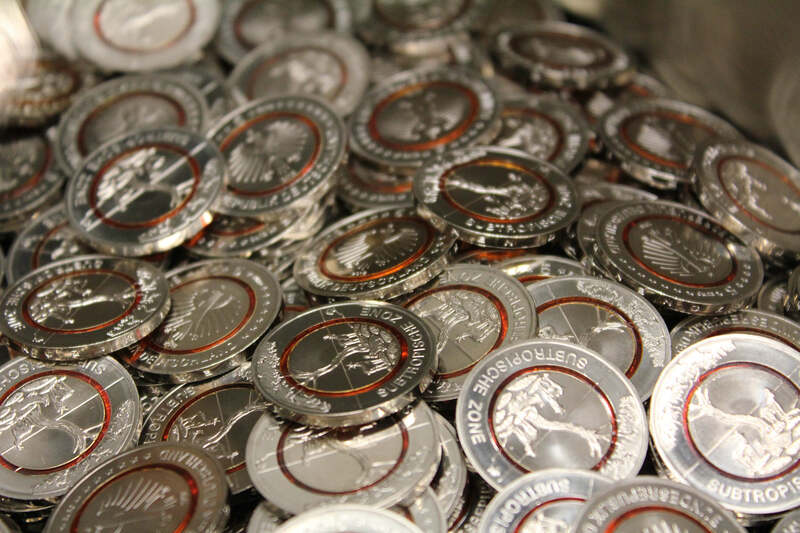 All coins in the series are equipped with a polymer ring between the ring and the core, which not only is aesthetically pleasing but can also serve as a state-of-the-art security feature. 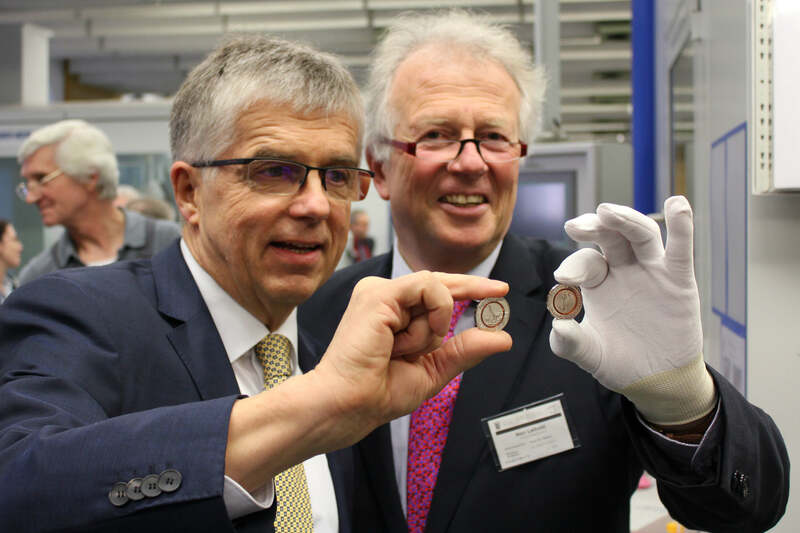 During the opening ceremony, Klaus Meyer-Steffens, representing the European Vending Association, talked about the new polymer coins’ advantages for the vending industry if they were to serve as circulation coins as well. The German coin with polymer ring is the product development of a working group, composed by representatives of the State Mints of Baden-Wuerttemberg, the Bavarian State Mint and the industry. It is characterized by its high level of counterfeit protection, for it offers the possibility of integrating overt, covert and latent security features for counterfeit detection. 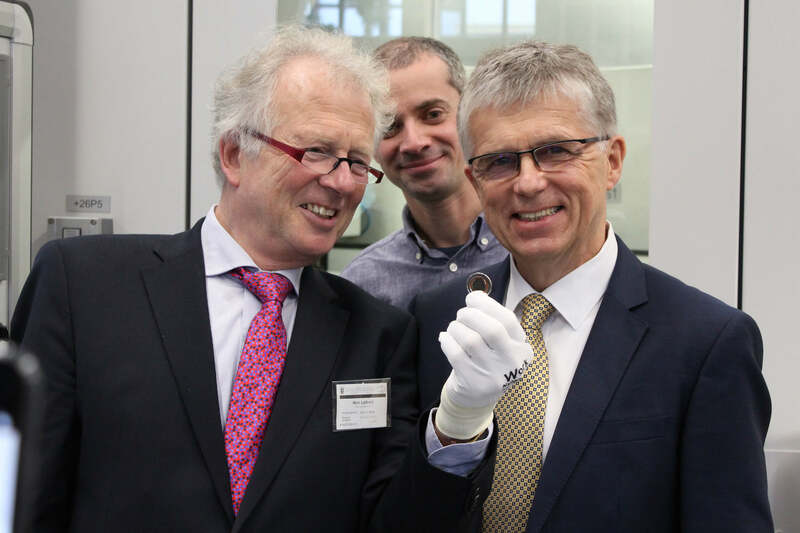 These features make the German polymer coin just as secure as a banknote. 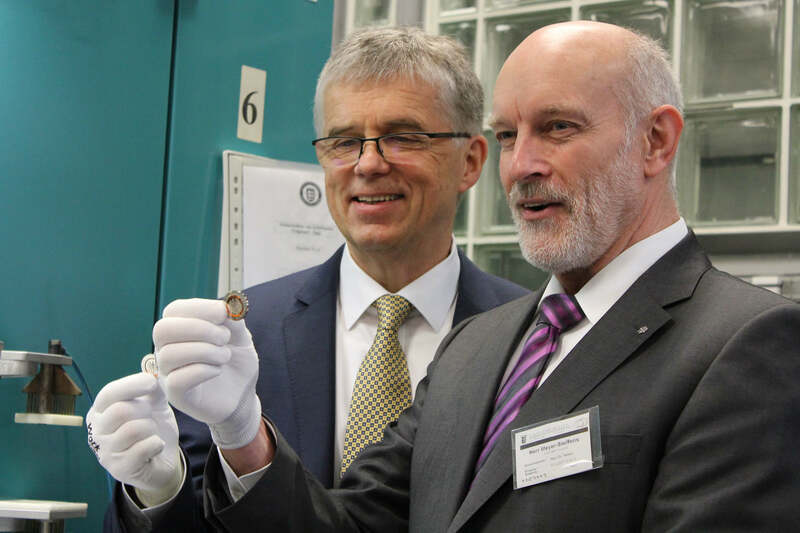 The overt counterfeit feature is its attractive, translucent coloured polymer ring, which is also minted in the process and thus exhibits the same relief as the metal. Immediately recognizable to every user, this security feature is virtually impossible to imitate by today’s counterfeiters. It would be easy to add a latent security feature through enriching the polymer ring by nanopigments, which – to name just one of the many possibilities – only become visible in UV light. Of particular interest to the economy is the fact that the coin with polymer ring promises a higher level of security when used in ATMs. This extra security would not go hand in hand with high costs for the vending industry, as there would be no need to replace existing systems, as they could be simply reprogrammed. Mint Director Dr. Peter Huber (left), Assistant Undersecretary Walter Leibold. 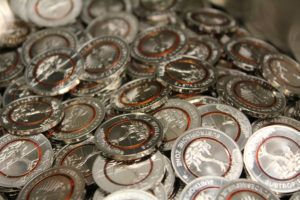 First strike circulating coin quality. 5-Euro Coins “subtropical climate zone” with orange coloured polymer ring. 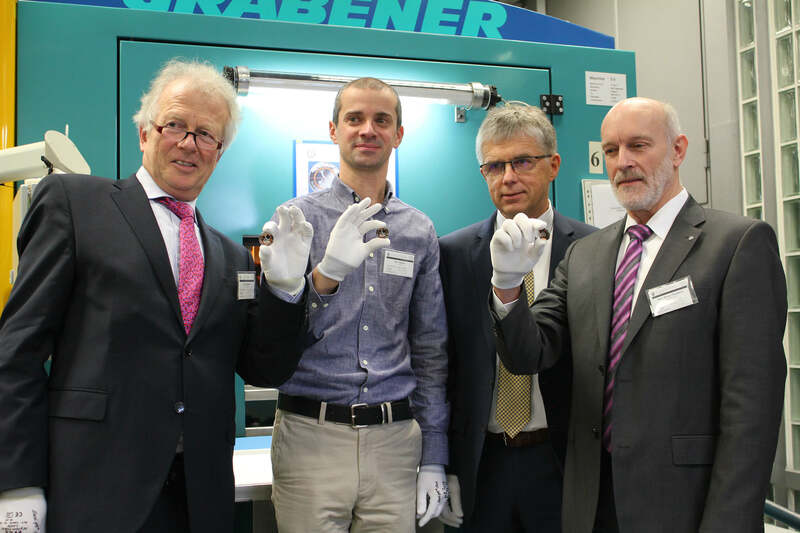 Klaus Meyer-Steffens, Crane Payment Innovations, who was closely involved in the development of the new technology as Chaiperson of the Coin Group of the Vending Industry, talked about the advantages of the polymer technology for the use in coin-operated vending machines. 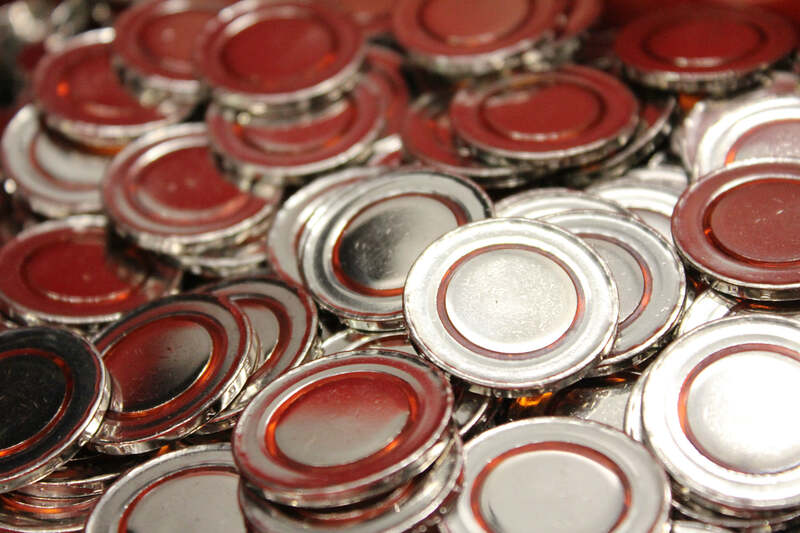 As vending machines can be used to distribute counterfeits on a broad scale, these are one of the primary targets of coin counterfeiters. Nowadays, ATMs are used everywhere and are constantly increasing in number. We encounter them at the express checkout in the supermarket as well as when buying tickets in public transport or paying the parking fee. We fill up our tanks at the unmanned fuel station outside of working hours and buy a drink or a snack from the vending machine installed on the platform before continuing our journey. All these machines check after the insertion of a coin whether it is genuine or fake. 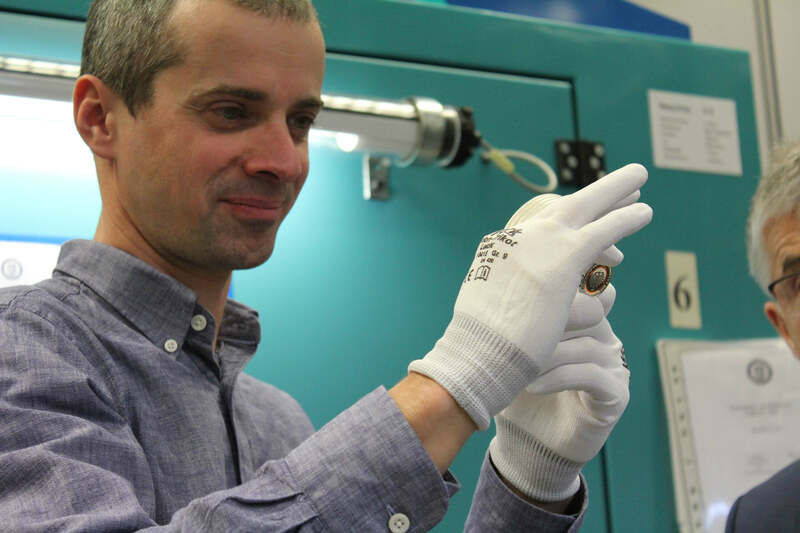 To this end, they use precisely tuned sensors to measure the properties of the material of the coin. The bi-metal coin had already provided a higher level of security for the vending machine, as it allowed testing two metals for their properties. However, since the sensors are extremely finely tuned and therefore cannot process the minimal reactions that occur at the transitional zones where the two metals meet, misinterpretations were made occasionally. This problem was addressed in the working group mentioned above. 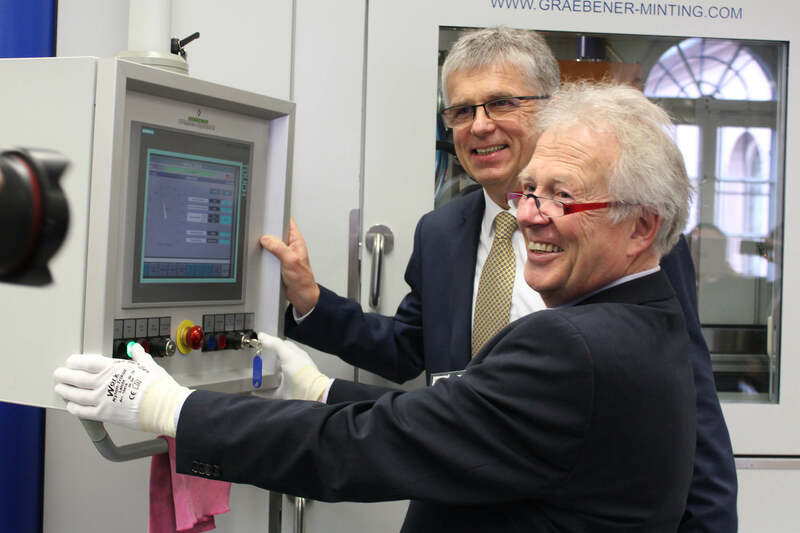 In eight years of research, to which also the Leibnitz Institute at the Rheinisch-Westfälische Technische Hochschule contributed, it developed the new mintable polymer. This enables the machines to measure the two metals completely separated from each other, which leads to a significantly higher accuracy of measurement. Assistant Undersecretary Walter Leibold (left), Mint Director Dr. Peter Huber. 5-Euro Coins “subtropical climate zone” with orange coloured polymer ring in proof quality. Mint Director Dr. Peter Huber (left), Klaus Meyer-Steffens (CPI). 5-Euro Coins “subtropical climate zone” with orange coloured polymer ring in proof quality. Artist Patrick Niesel. 5-Euro Coins “subtropical climate zone” with orange coloured polymer ring in proof quality. As a matter of fact, the new polymer material has already won two international professional awards for the technologically most innovative coin. 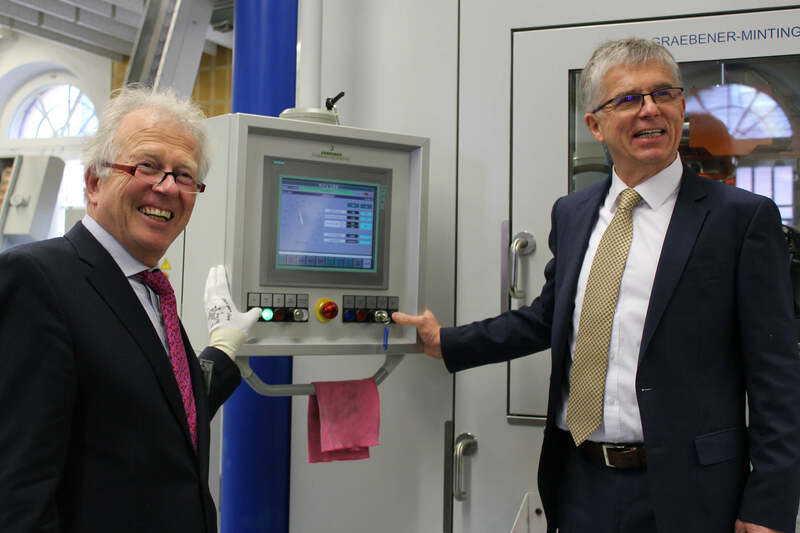 After a ceremony, Assistant Undersecretary Walter Leibold first set the joining machine for the blanks in motion, followed by the minting press for the commemorative coins’ proof version. At the proof press he then struck the initial proof specimen. The second was struck by Klaus Meyer-Steffens and the third by Patrick Niesel, the artist who was responsible for the design of the obverse.